Sea lions in the Galápagos are somewhat tame, and very curious. The Galápagos Islands (Archipiélago de Colón in Spanish) are a group of islands in the Pacific Ocean which now belongs to Ecuador. The islands are famous for having many native animals, including giant tortoises, that are found nowhere else on Earth. These animals helped Charles Darwin towards his theory of evolution by natural selection after he visited the islands in 1835. 97% of the islands are a national park, all except the inhabited parts. The Galápagos National Park is a UNESCO World Heritage Site (1978), a marine reserve (1980), and a biosphere reserve (1986). The Galápagos Islands are on the equator, 973 km (604 miles) from Ecuador in South America. There are 19 islands with a total of 8,010 square km (3,093 sq. miles) of land. The islands were made from volcanoes, and volcanoes are still making the islands of Isabela and Fernandina today. The most recent volcanic eruption was Cerro Azul in May 2008 on Isabela Island. In 2001, about 18,000 people lived in the Galápagos Islands. Most people have come from mainland Ecuador to live in the islands within recent years (about 3500 people lived on the islands in 1972). Most people are from the Mestizo ethnic group, which are the descendants of Spanish and Native American peoples. People live on only 5 of the 19 islands of the Galápagos: Baltra, Floreana, Isabela, San Cristobal and Santa Cruz. Puerto Ayora is the biggest town, where about 10,000 people live. Puerto Ayora is on Santa Cruz Island. The second biggest town is Puerto Baquerizo Moreno on San Cristobal with about 5,600 people. Puerto Villamil is the town of Isabela Island, where about 2,000 people live. 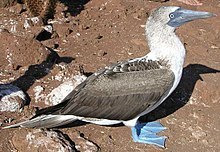 There are approximately 30,000 people living in the Galapagos as of 2012. Tourism has steadily grown over the last two decades; in 2012 it is estimated that 200,000 tourists will visit the Galápagos Islands. The islands are one of the 24 provinces of Ecuador. The capital of the province is Puerto Baquerizo Moreno, a town with 5,600 people. There are three cantons in the province. Each canton has a seat, which is a town like a capital. All of the islands of the province are in one of the three cantons. Galápagos hawk, Buteo galapagoensis, the islands' main scavenger and "environmental police"
↑ UNESCO, "Galápagos Islands"; retrieved 2012-4-21. ↑ World Network of Biosphere Reserves (WNBR), "Archipielágo de Colon (Galápagos)"; retrieved 2012-7-18. ↑ 3.0 3.1 "Galapagos Islands". Encyclopaedia Britannica Online. Retrieved April 22, 2009. 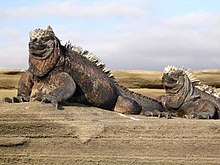 ↑ "The Galapagos Islands Fact Sheet". Galapagos Conservation Trust. Retrieved April 22, 2009. 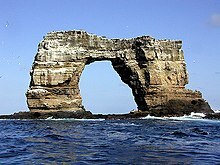 Wikimedia Commons has media related to Galapagos. This page was last changed on 30 September 2017, at 10:02.